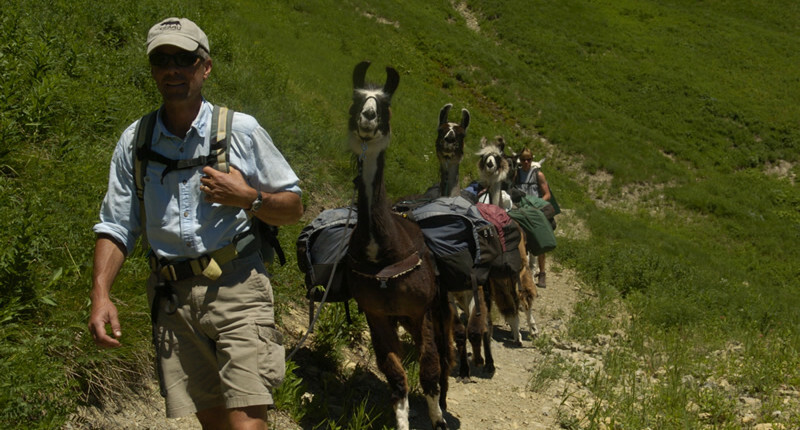 Announcement: Get your reservations in early for llama trekking! 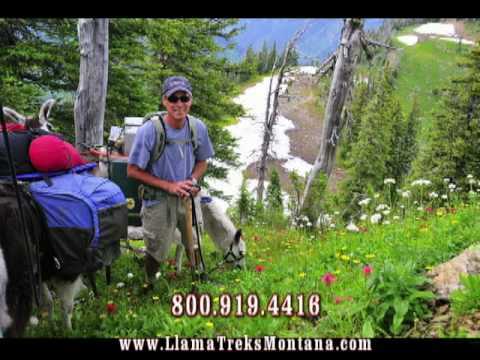 Strong and gentle, quiet and agile, llamas are the perfect companion for a pack trip into Montana’s Glacier Country. With their padded foot, cleanliness, calm nature and ability to graze on a variety of vegetation, llamas have no more impact in the high country than a deer. 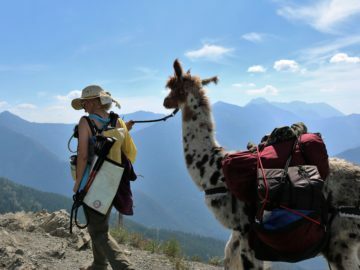 Alert and surefooted, these beautiful Andean natives tote our gear with ease as we meander along the Swan Divide of the Flathead National Forest, a spectacular ridgetop trail with endless views of three surrounding wilderness areas, the Continental Divide and Glacier National Park. 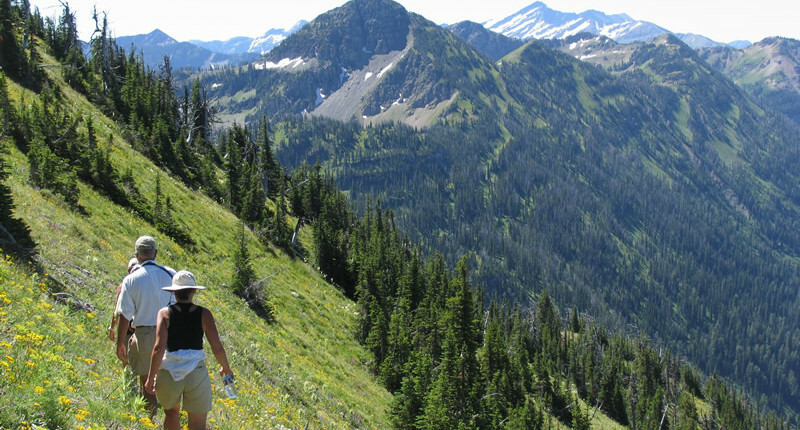 Our pinnacle trip takes you into a remote area of the Bob Marshall Wilderness Complex. On all of our guided hiking trips we spend each night in a cozy campsite by one of the many alpine lakes which dot the area. Montana’s long summer evenings (it is light until 10:30 p.m.) give the ambitious plenty of time to climb a nearby summit to watch the sun set, while others stroll around the lake or sit by the fire with a cup of hot chocolate or brandied cider. Your guides prepare all the meals, and our guests love our delicious backcountry menu, with a Montana flare. We do all we can to give you an unforgettable vacation, but nature provides the real memories: a sunset silhouetting peacefully grazing llamas; swimming in crystal-clear mountain lakes; napping in alpine meadows carpeted with wildflowers; being awakened by a curious deer; sledding in mid-summer snowfields; jumping into a waterfall pool; fishing for scrappy rainbow trout; feasting in a trailside huckleberry patch; glimpsing mountain goats, an elk herd or a soaring eagle. Wildflowers, waterfalls, wildlife, snow fields, alpine lakes ~ see it all in Glacier Country! 7-days a week. Reservations required for all trips. Tipsy Brush Treks will take place once monthly based on interest. Call for details regarding future or custom trips. Group discounts of 10% off are available for groups of 6 or more. Kids discounts of 10% off are available for children 12 and under. Click here to view our current rates and dates. Ready for a Trek? Submit an inquiry!